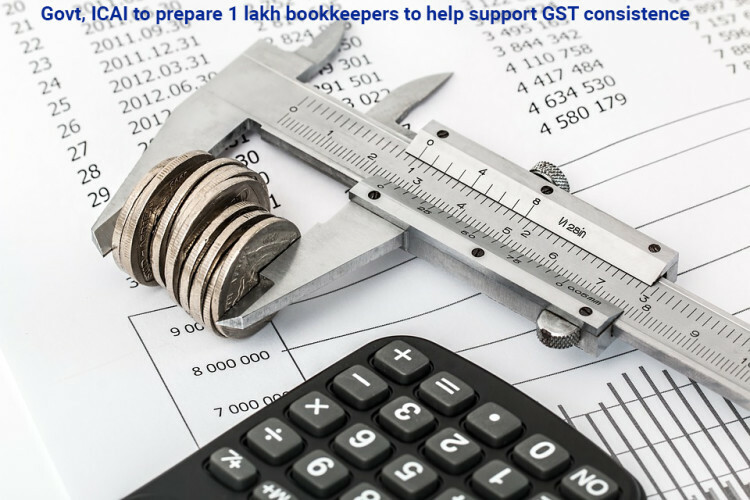 The Government of India, alongside The Institute of Cost Accountants of India (ICAI), is good to go to dispatch an across the nation GST-preparing system to prepare one lakh bookkeepers in the nation to empower them to convey GST consistence, particularly to little and medium endeavors (SMEs) that are battling with consistence. The program is required to be propelled one month from now. ICAI president Amit An Apte said the Niti Aayog had proposed the program, which plans to prepare one lakh GST bookkeepers in around a year's time. Apte said GST consistence was a noteworthy issue for SMEs and they confronted challenges getting great experts for GST consistence. "This course will help facilitate the supply of bookkeeping experts who might empower them accomplish consistence," he included. "The whole program will be government-supported with ICAI as the accomplice. Selection tests will be directed for the GST bookkeeper course and the individuals who are not expertly qualified starting at now to be GST counselors/advisors will be qualified for this program," Apte said. The year-long program will be 80 hours in length and will be led in three clusters. ICAI will prepare the coaches and convey the program through 100 sections and 300 augmentation focuses crosswise over India. Balwinder Singh, VP of ICAI and director of Cost Accounting Standards Board, said the Institute has finished 75 years and has added to the development in the nation, upgrading cost aggressiveness of the Indian business and supporting the execution of GST. "For the GST bookkeepers program, ICAI had arranged the prospectus and the books are prepared," Singh said. This was likewise a method for producing work as these bookkeepers can act naturally utilized, he included.